Candied Pineapple is a sweet treat that's great for baking and as an edible cake decoration. You can also add it to trail mix for a bit of sweetness. This candied pineapple recipe is a classic that produces sweet, chewy candied pineapple. This is a quick and easy recipe that anyone can follow. Drain the pineapple cans and reserve the juice. Measure out 1.5 cups of juice, and if for some reason you're short, add a little water to make 1.5 cups. Pour the juice into a large, wide skillet, add the 2.5 cups of sugar and the corn syrup, and turn the heat to medium. Stir until the sugar dissolves and bring the mixture to a slow boil for 4 minutes. Turn the heat down to low and add the pineapple rings. Try to fit them in a single layer, but if there isn't enough room, space them out as much as possible. Boil the pineapple in the sugar syrup and turn the pieces frequently to make sure they're covered and not sticking together. Cook them for about 45 minutes, or until they are entirely translucent. If it is hard to tell, take the pan off the heat for a moment or two until the bubbles die down and you can see the rings clearly. 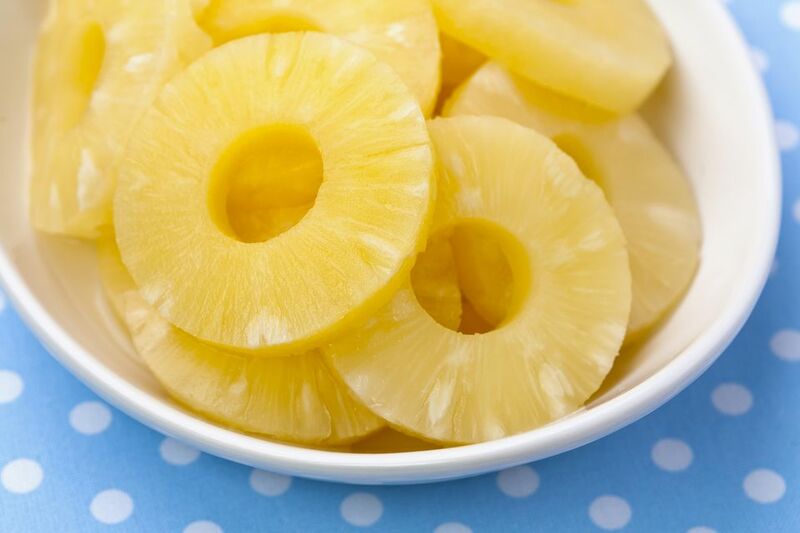 Once translucent, remove the pineapple from the sugar syrup and place them on a drying rack to dry off. The syrup can be discarded, or you can save it to use as a drink mixer or to top pancakes or waffles. If you live in a dry climate, the rings can be left out overnight to dry. If you live in a moist climate or want to speed the process up, place the drying rack in an oven set at 200 F for about 30 minutes, or until the pineapple does not feel sticky to the touch. Allow them to cool, then roll the rings in granulated sugar to serve. Store Candied Pineapple in an airtight container at room temperature for up to a week. Depending on the humidity, it might become sticky and need to be re-rolled in sugar before serving.